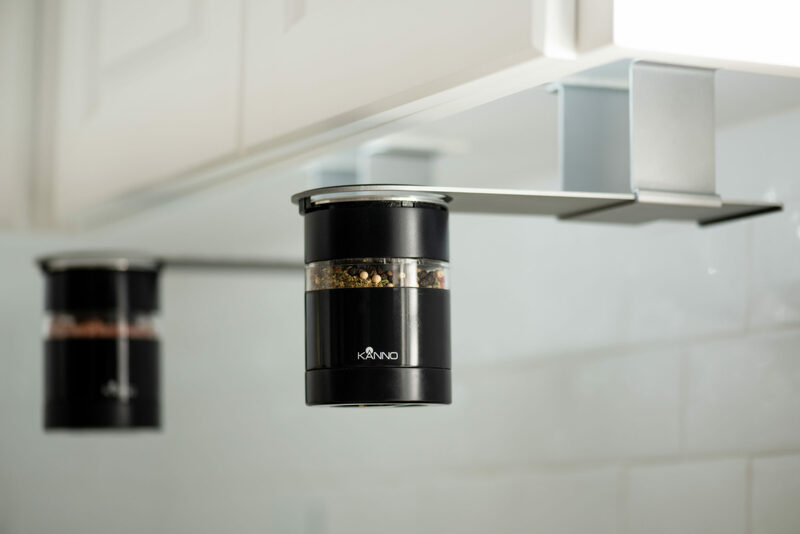 Kanno is a hands-free, automatic spice grinder and dispenser. 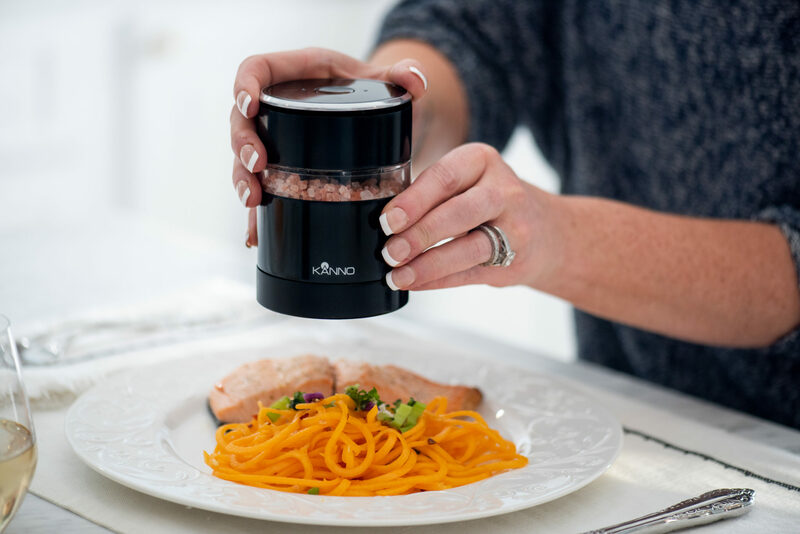 Activated by a sensor, Kanno automatically grinds spice onto a plate that is placed beneath the dispenser, allowing you to add the perfect amount of seasoning to your food without touching a button or container. 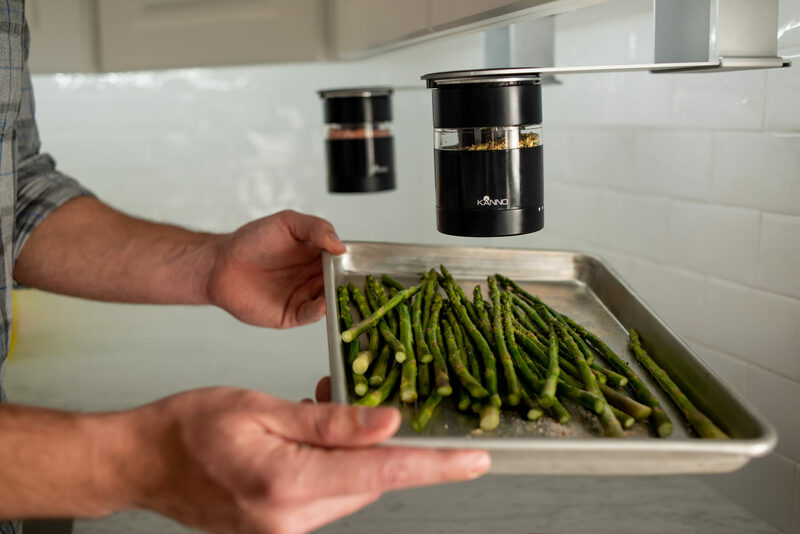 Whether you prefer the dual or single Kanno stand, or the under-the-cabinet mount, Kanno saves time, eliminates the spread of bacteria, and makes seasoning meals almost effortless. Kanno operates completely hands free to help prevent the spread of harmful bacteria. During food preparation, bacteria that causes disease can easily be transferred from one food to another through hands, work surfaces and utensils. You probably touch your spice grinder after touching raw food without washing your hands. With hands-free spice grinding, you can help prevent the spread of dangerous germs. 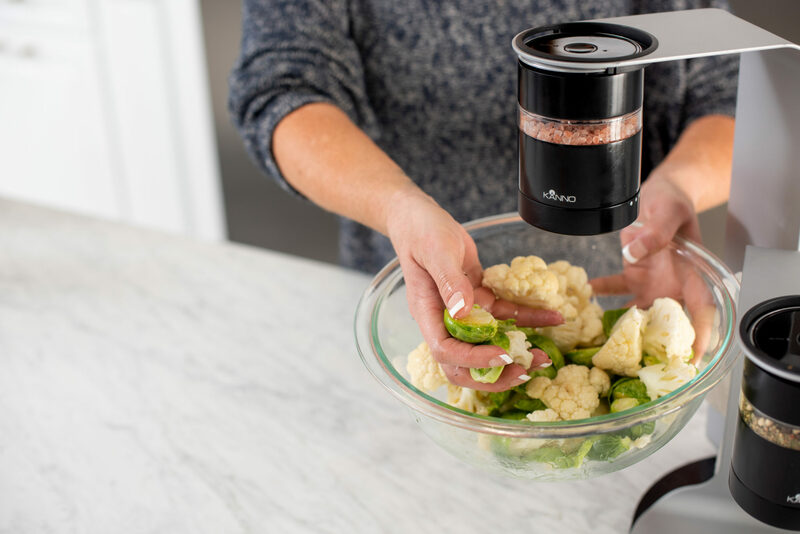 Activated by a finely-tuned lidar sensor, Kanno will start grinding when you place your food or plate under the sensor. It will stop dispensing when the plate is lowered away from the sensor, preventing excess pour or spillage. With Kanno, seasoning your food becomes almost effortless. The dispenser can dispense pre-ground spice, like a barbecue rub, or completely grind whole spice. The dispenser can also be stored in different ways — on top of the stand clip or hanging from the stand clip. 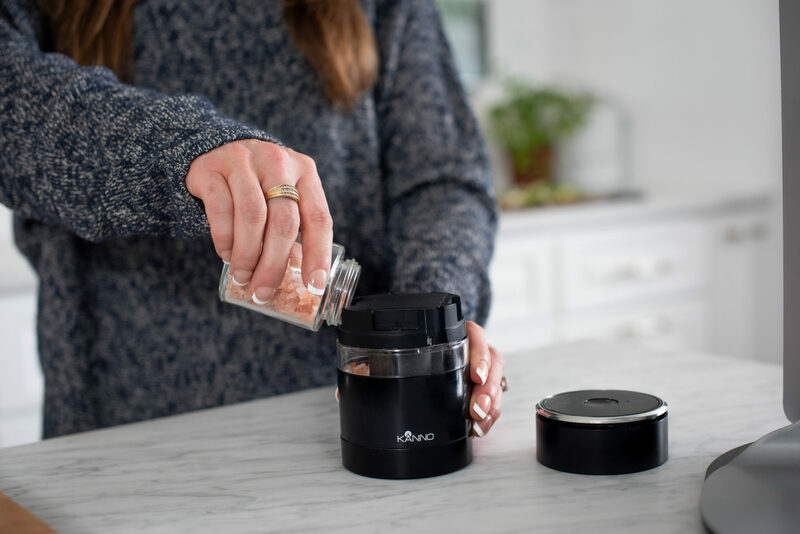 The seasoning dispenser can not only function hands-free, but it can also be used as a traditional push-button device — perfect for guests gathered around the table. Kanno can grind and dispense spices at the grain size of your choice with various coarseness settings. People worldwide will benefit from this technique that saves time and energy. The grinding mechanism is fueled by 4 AAA batteries (not included). 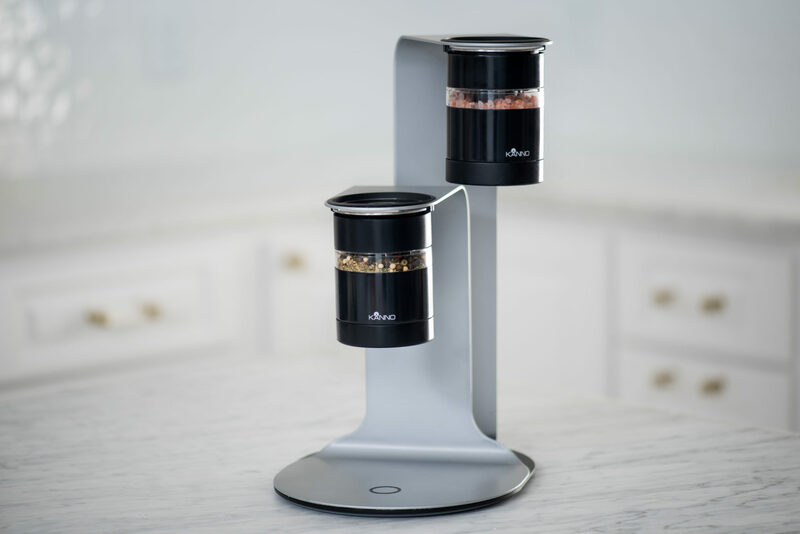 The Kanno countertop stand option will raise the spice grinder(s) off the countertop to evenly distribute spices onto your plate. The double stand allows you to store two grinders within the same counter footprint as a single stand and will keep the canisters optimally spaced apart with arms that pivot to the side for easy access. The countertop stand is silver, powder-coated steel that will function beautifully in your home. A silver, powder-coated steel holder with one matte black spice dispenser will keep Kanno out of the way. The mount has an adjustable slide that lets you pull the grinder in front of the cabinets or push it back for more discrete use and storage. It conveniently mounts to any standard size kitchen cabinet.